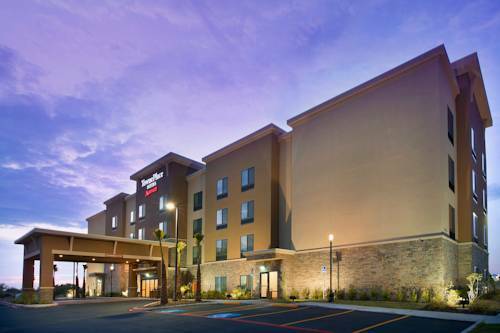 TownePlace Suites by Marriott Eagle Pass is a pet-friendly extended-stay hotel where guests enjoy spacious accommodations and excellent amenities. Our stylish hotel suites come with fully equipped kitchens and free high-speed Internet access, so you can enjoy all of the comforts of home during your Texas getaway. Wake up to a complimentary breakfast buffet each morning and stay active at our modern fitness center. Relax year round by the outdoor heated swimming pool and patio with barbecue. Our hotel in Eagle Pass is close to popular local attractions like Kickapoo Lucky Eagle Casino and the world famous Rio Grande River. They are also just across the border from many manufacturing plants in the town of Piedras Negras, such as Gilbane, Constellation Brands, Barry-wehmiller Design and Littelfuse. Whether youre in Eagle Pass, Texas for business or pleasure, our professional hotel staff is ready to assist you to make your stay a memorable one, so give us a call and make your reservations today. - Eagle Pass Golden Crossing, Inc.